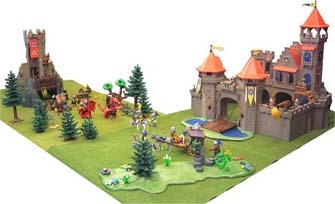 The Augmented Knights’ Castle is a Playmobil medieval castle playset embedded with RFID technology, created by Steve Hinske (Computer Science,ETH, Zurich) and being evaluated and further developed at the University of Sussex (see this article). We are assessing how adding location-specific sounds (music and sound effects) and verbal commentary to the playset supports the development of children’s listening, speaking and narrative skills. We have had encouraging results with typically-developing children and children with autism. We are now developing the set further, to support children’s narrative development after playing with the set.